Basic Airlift Systems transfer items between two similar Send/Receive Stations through a single interconnecting tube. upward, downward, or horizontal runs. with an enamel finish. Station doors are manufactured from heavy steel. blower operates only when a Carrier is in transit, not 24 hours a day as many other system do. minimum of space on walls, building columns, or any convenient flat surface, without using prime plant floor space. system into an existing wall outlet. design generate minimal friction, permitting dramatic increases in system capacity and length. time taken from more productive work...and deliver the goods ten times as fast! one location to another with the ease, speed, low cost, and safety of an Airlift system. For loads up to 1 lb. and distances to 1,000 feet. 26% more volume than ordinary carriers. For loads up to 3 lbs. and distances to 2,000 feet. 40% more volume than ordinary carriers. For loads up to 5 lbs. And distances to 1,000 feet. more capacity at 1/3 the weight of ordinary carriers. ON until the receiving Station door is opened. features designed to eliminate the chance of user injury. All of these safety and control features are standard and built into Airlift Pneumatic Systems, not added at extra cost. in process of receiving a Carrier. Fully automatic. No user action required. Airlift Pneumatic Systems assure you of the finest in engineering, material, workmanship, and service.  Standard tubing, bend, and couplings made from strong, lightweight, non-corroding, dent-resistant PVC. 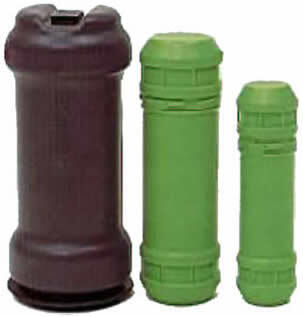  High-volume, low-friction Carriers made from long-wearing, high-density plastic with locks and finger holds. primed surface to insure a permanent, hard finish.  Station doors fabricated from heavy steel.  Full-size rubber door gaskets resist compression-set and prevent air leakage.  Swing arm assembly and exclusive Safety Door Lock mounted on the frame for strength.  Swing arm's trapeze design is fastened at both ends, not just one side.  Acoustical foam Station interiors absorb noise and provide additional Carrier cushioning for longer life.  Total solid-state electronic controls mounted on a plug-in PC board that can be replaced in minutes if necessary.  Electronic system timing for precise blower shutdown.  Stations shipped individually in specially-designed cartons to insure damage-free arrival. new or existing building using all factory-supplied components. and a quality control or test site.  Reduce the noise of Carrier impact.  Produce a smooth, non-turbulent, jolt free transmission of the Carrier's cargo. the Carrier and the tubing walls. Variable-Volume Carrier Speed Controls are standard in 6-in. systems, and available at nominal cost in 3-in.  A remote blower that restricts all blower noise to a location where sound is not objectionable. intake can be incorporated into an Airlift Pneumatic System to provide a moisture-free atmosphere.  Telescoping expansion joists for long, straight runs in variable-temperature conditions. 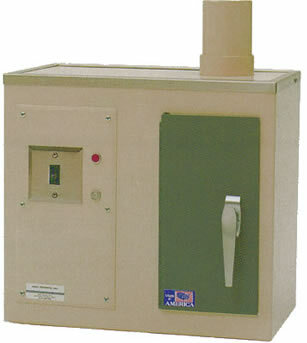  Fire dampers - guillotine type - when tubing must penetrate fire walls or floors. 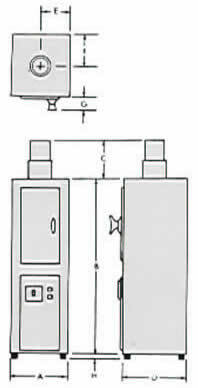  Stainless steel Send/Receive Stations for food processors, medical facilities, and laboratories.  Downsend available on all models.  Special paint finished to match your color scheme.  Extra-long Carriers for blueprints, photo plates, x-ray films.  Static-free Carrier linings for transporting electronic components or photographic materials.  Inexpensive between-floors system that uses gravity to drop carriers and pressure only for return.  Clear, high-impact plastic doors.  Steel tubing systems available in 2-1/4", 3", 4", 4-1/2" and 6" round, and 4" x 7" oval. doors & solid-state circuitry, two (2) 90 degree bends, four (4) carriers, (9"
& all necessary couplings, hanging strap, hardware, cement and cleaner. Pneumatic Dispatch Systems, and Pneumatic Tube System from your complete source for material handling equipment.